I usually prefer to eat the fruits raw and whole, unlike juices, fruit custards, fruit salads etc. But when Pia hosted this event and encouraged me to participate I wanted to give it a try with these tangy fruit combination. I have added some spices to subtle the tanginess and nuts to add some crunchiness, result is Yummy fruit salad with a Kick. Here is the recipe for you, Enjoy! 1. Cut the 6 Pine apple rounds into semi circle. Save 4 to 5 apple long wedges. and Cut the strawberry into thin slices. 2. Cut the remaining pine apple and apple into cube size chunks. 4. Take a wide bowl and arrange three to four semi circle pine apple slices. 5. Place the fruit mixture on top. 6. And top with roughly chopped walnuts. 7. Garnish the remaining pine apple slices, apple wedges and strawberry slices. 8. Pour the honey on top and let it sit for 1/2 hour to sink in all the flavors. (if you like chilled, you can keep it in the refrigerator), I like it at room temperature. 9. Now, sit back and relax by enjoying your whole-sum yummylicious Fruit Salad. As I couldn't find the good fresh pineapple in this season, I have used the can. Otherwise feel free to use the Fresh Pineapple. I don't have chat masala, so I have used Pavbaji Masala. It can be substituted with Chat Masala. 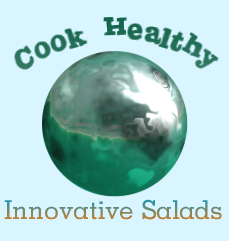 I am sending this to Cook Healthy Innovative Salads Event by Pia. Wat a fabulous salad, loved the addition of pav bhaji masala powder, simply awesome..